You are here: Home / Financial Planning / Latest NPS Partial Withdrawal rules | Is NPS a good investment choice? The Centre made NPS scheme mandatory for all the employees who joined the service on or after January 1, 2004. It has since been adopted by most state governments also. Currently, NPS has more than 1.7 Crore subscribers with total Asset under Management (AUM) of more than Rs. 2 lakh crore. National Pension System (NPS) offers two types of accounts – Tier I and Tier II. The Tier 1 account is non-withdrawable till the person reaches the age of 60. Partial withdrawal before that is allowed in specific cases. After attaining 60 years of age, you are allowed to withdraw 60% of the total Corpus amount and at least 40% of the accumulated wealth in the NPS account needs to be utilized for purchase of annuity/pension plan when you turn 60 years. On the other hand, the Tier II National Pension Scheme account is just like a savings account and subscribers are free to withdraw the money as and whenever they require. Tier 2 NPS Account does not qualify for tax rebate under section 80C of the Income Tax Act. Latest Update : Contribution by government employees (only) under Tier-II of NPS will now be covered under Section 80 C for deduction up to Rs 1.5 lakh for the purpose of income tax provided there is a three-year lock-in period. This is w.e.f April, 2019. 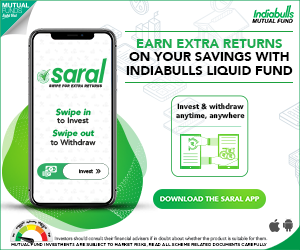 Quantum of Partial Withdrawal : You shall be permitted to withdraw accumulations not exceeding 25% of the contributions made by you and standing to your credit (but excluding contributions made by the employer), as on the date of application of withdrawal. Any other critical illness of a life threatening nature as stipulated in circulars, guidelines or notifications issued by the authority from time to time. Limits : To make a partial NPS withdrawal claim, you should have been contributing to NPS for a minimum period of 3 years. You can withdraw up to 25% of your contributions. Frequency of partial withdrawals : You will be allowed to withdraw a maximum of three times during the entire tenure of subscription to NPS. Tax implications : Kindly note that partial withdrawals are tax-exempt. It should be simple and easy to understand. Should be a tax efficient product and ideally should fall under Exempt – Exempt – Exempt category. You should be able to withdraw the whole corpus at the time of retirement and you should be allowed to re-invest the corpus as per your choice/requirements. Retirement planning is a long-term goal, so when we are investing for a longer period, I prefer to invest in a simple, flexible, easy to understand, tax efficient & highly liquid investment option. If it is mandatory for you to contribute to NPS then you do not have any choice but to contribute. If you want to make voluntary contributions then I believe that NPS is not a great investment avenue with the given product structure & current tax implications. Sir, Pronam, I will be retiring from Bank service on 30Sep 2026.I will be getting 60% at a lump sum from NPS and rest 40% I have to Ask for an annuity pension. Can u tell me how much pension I may get and whether Still I have to continue contribution to NPS. There is no need to contribute to NPS (mandatory contributions Tier-1) after the service period ends. The pension amount is dependent on the Annuity plan you chose (amount is based on the then prevailing annuity rates). I have withdrawn the entire amount of less than Rs. 2 lacs on attaining 60 years. Out of this 40 % of withdrawal is taxable and balance 60 is taxable as per extant instructions. After attaining 60 years of age, you are allowed to withdraw 60% of the total Corpus amount and at least 40% of the accumulated wealth in the NPS account needs to be utilized for purchase of annuity/pension plan when you turn 60 years. The 60% is allowed to remain in the account which can be withdrawn anytime before you complete 70 years. The account has to be closed on completion of 70 years of age. I believe that this 60% as and when received can be shown under the head ‘income from other sources’ . 60 % is taxable as per extant instructions . In case the total corpus in the account is less than Rs. 2 Lakhs as on the Date of Retirement (Government sector)/attaining the age of 60 (Non-Government sector), the subscriber (other than Swavalamban subscribers) can avail the option of complete Withdrawal. However 60% of this withdrawal will be taxable. Hi… Very Informative Artcle about this complex NPS…. I joined Railways in 2013 and contributing to NPS tier 1 since…. My total investments is more than 3L….Im planning to resign from govt job and joining a private comp…. Is there any option to close my NPS ac fully and withdraw all the money? You can apply for a pre-mature exit only after 10 years. In case, the total corpus is less than Rs. 1 Lakh, the subscriber can withdraw 100% as lump sum (40% of which will be tax exempt). Where the total corpus is more than 1 lakhYou can apply for a pre-mature exit only after 10 years. Sir, I am a subscriber of NPS tier 1. My date of appointment in service is 9/10/2006. Am i eligible for partial withdrawal of amount from NPS due to construction of own house. You can make partial withdrawal for the purchase or construction of residential house or flat in your name or in a joint name of your spouse. In case, you already own a residential house of flat (either individually or in the joint name), other than an ancestral property, no withdrawal under these regulation shall be permitted. Dear VIPAN .. It it is Tier-II account, there are no restrictions as such for withdrawals. Do watch out for tax implications though. I believe the purpose has to be, ‘for marriage of your children, including a legally adopted child’ and may not be for ‘Self marriage expenses’. Is there any provision of nps withdrawal for self marriage? Dear Anoop ..As per the notification, it refers to partial withdrawal in the case of Children’s marriage only..
Dear YOGESH ..it’s not allowed for the said purpose. I have few doubts about nps in general. 1. Is there any option to move my existing equity investment within nps to corporate and government portion and vice versa? The choice to change the percentage twice a year is only for new investments, is that right? 2. There is an option to withdraw from nps after 60 years of age in staggered manner for 3 years I believe. How does the annuity and taxable/non taxable withdrawal work in such cases? 1 – The asset allocation refers to existing accumulation corpus as well as future subscriptions. 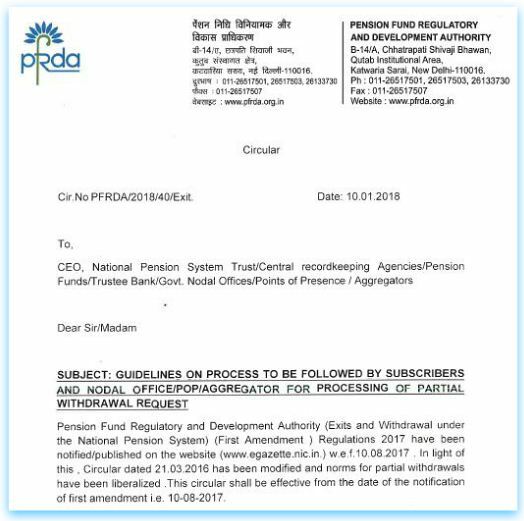 Kindly go through this PFRDA circular..
2 – At least 40% of the accumulated wealth in the NPS account needs to be utilized for purchase of annuity/pension plan when you turn 60 years. Let’s understand this with an example : If your total corpus is Rs 100 at the time of retirement (60 years), you can withdraw Rs 60 as a lump-sum amount and Rs 40 (minimum) has to be used to buy an Annuity plan from a Life insurance company. Out of the sixty rupees, Rs 20 will be taxable as per your income tax slab at the time of retirement and the Rs 40 is tax-free amount. Kindly note that the taxes are applicable on the corpus amount and not just on the Gains. (The minimum quantum of investment in Annuity product depends on WHEN you choose to exit from the NPS account). 1. This question was nagging me for quite some time. Thanks a lot for clarifying! So the question that I have is, that 60% that I can differ withdrawing for 10 years (not 3 years as in my first comment), can that be withdrawn in staggered manner/partially over that period of time? If so, then do we do the 40-20% calculation for every withdrawal? And in the second quote, does it mean that 40% of the corpus will be credited to my bank account at age 60 no matter what to invest in annuity in next 3 years? Or can that withdrawal of 40% be deferred too like the rest of the amount? I have always believed that NPS is a complex product and I am sure 90% of its investors do not have clear cut idea about the features of this product. One can stay away from NPS unless it is mandatory to invest (like for Govt employees). Yes, 60% withdrawal can be deffered. I have read it sometime back that as per the PFRDA the lump sum amount (60%) can be withdrawn in up to 10 annual installments till the age of 70. Please note the installments need not be equal. Kindly go through this PFRDA Circular..
A follow-up on the first question. Does nps do automatic rebalancing to maintain asset allocation ratio? I checked my account, I could not see any such activity last few years. Is there any way to do that? I believe that NPS subscribers, other than government employees, can choose between two options for how they select allocation to different funds. Both active choice and auto choice give you some control over where your money is invested. Rebalancing (reallocation) among the asset classes is done automatically on the date of birth of the subscriber. I checked few years transaction statement but I don’t see any automatic movement in units other than my contribution and charges. Can you please reference any literature that states that they do automatic rebalancing? 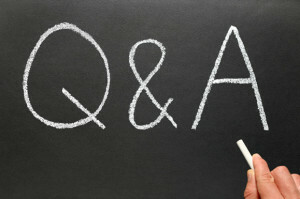 Is it may be for one of the choices – auto vs active? Dear Cvan ..The option should have been AUTO.. In 2016 and in 2017 i invested 50,0oo rs each year.Now after reading your views i feel i shouldnt have invested in NPS. What to do now ? As i received mesg from NPS to pay for year 2018.How to exit from it? or should i continue investing in it in small minimum amount to keep it continue till end? The basic product structure is complex. However, we may expect the tax implications to be on the positive side in the future, especially the withdrawals and/or annuities. But that’s an expectation! You may continue to keep your NPS account active by making minimum contributions (as of now). Thank you very much. You doing nice job by educating people unbiased unlike news paper. All the best. Thank you! Keep visiting ReLakhs ! As per my understanding 40% commutation is allowed tax free and remaining 20% will be considered in income of that year. Correct me if guidelines is something different. You If your total corpus is Rs 100 at the time of retirement (60 years), you can withdraw Rs 60 as a lump-sum amount and Rs 40 (minimum) has to be used to buy an Annuity plan from a Life insurance company. Out of the sixty rupees, Rs 20 will be taxable as per your income tax slab at the time of retirement and the Rs 40 is tax-free amount. Kindly note that the taxes are applicable on the corpus amount and not just on the Gains. (The minimum quantum of investment in Annuity product depends on WHEN you choose to exit from the NPS account). If amount in the credit of nps below rs 200000 can it will be full withdrawal on attaining age of 60 years.kindly clarify. 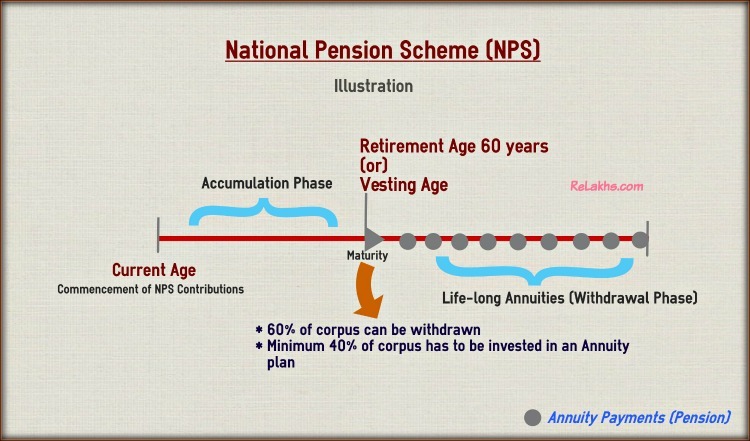 If it is a Tier-1 account then, at least 40% of the accumulated wealth in the NPS account needs to be utilized for purchase of annuity/pension plan when you turn 60 years. After attaining 60 years of age, you are allowed to withdraw only 60% of the total Corpus amount.